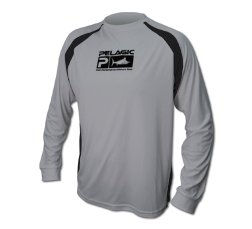 Pelagic Gear Sunshields: New Models!!! 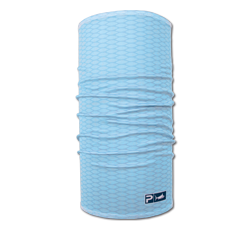 The PELAGIC SUNSHIELD was specifically developed to be lightweight and breathable, while providing an extra layer of protection from the sun’s harmful and damaging ultra violet rays (SPF 50). 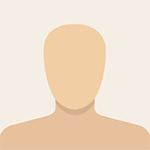 Wear it to protect your face, head, neck, and ears from direct exposure to the sun. 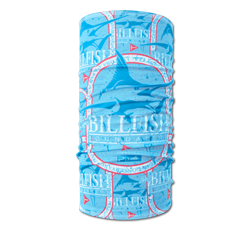 Featuring custom pixel camo design and Pelagic/The Billfish Foundation collaborative design. Full range available at Lure Haven. 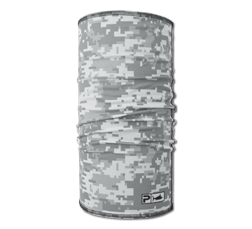 The Pelagic Ambush Boardshort features a stealthy digital camo design on an ultra-lightweight, 4-way stretch, rip-stop fabric. This boardshort offers anglers and watermen multiple reinforced plier/utility pockets, as well as a cargo side pocket and zipper rear pocket. In addition, this all-purpose boardshort comes with a water-resistant pouch to keep your phone safe and dry while secured in your pocket (NOTE: Do NOT swim with phone in pocket). Specially treated with “Quik-Dry” technology and anti-microbial properties, the Ambush Boardshort is built for action on or off the water. 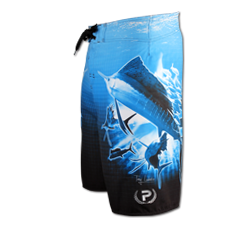 Pelagic Gear: "4-Tek Boardshorts - Sonar"
The short that all anglers will appreciate! 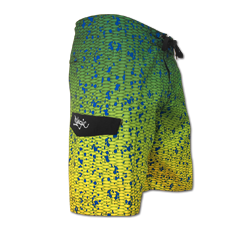 Guaranteed to catch the eye of any fisherman, the 4TEK Fish Finder Boardshort features a high-definition sonar graphic, complete with bottom structure, bait balls, and gamefish “blips”. Built with both anglers and watermen in mind, this super-stretch boardshort embodies next-gen design with 4-way stretch technology, and ultra-lightweight, Quik-Dry fabric. Complete with side and back zipper pockets, and a lined utility/pliers pocket, this all-purpose boardshort will simply put you in the mood to go find some fish! 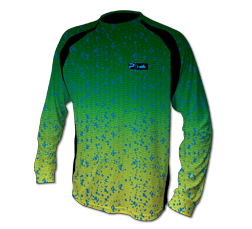 Pelagic Gear: "Dorado Green" Boardshorts"
Become one with the fish… but don’t get eaten! 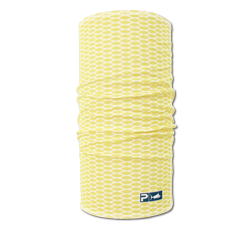 Choose your mood and go blue or go green in 100% Microfiber “Quick-Dry” Dorado-Skin fabric. The DORADO Boardshorts are super soft and comfortable, with custom Dorado print fabric that looks just like the real deal. 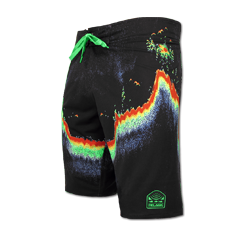 Any person lucky enough to cross paths with one of these aggressive and acrobatic, yet beautifully majestic game fish can surely understand why these shorts are a must-have item. Packed with comfort, these shorts feature neoprene-stretch-fly, a side cargo pocket with drainage holes, a back pocket with zip closure, anti-rash lycra taping, custom PELAGIC script logo pocket embroidery, and 3-D gel logo on back waistband. 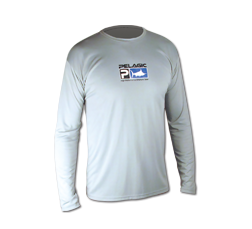 Pelagic Gear: "Evolve Hybrid Shorts"
Made for life on or off the water, the Evolve Hybrid Short offers a classic look with next generation design. An angler’s walkshort, built with our proprietary 4-TEK Super-Stretch “Quick-Dry” boardshort material, this short features 2 front pockets, 2 back pockets, a side utility/cell phone pocket, belt loops, and front zipper-fly. 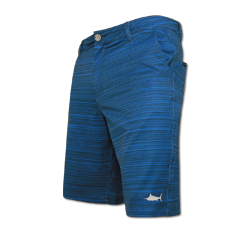 Stamped with a left leg marlin silhouette and right leg vertical text logo, the Evolve Hybrid Short is a must-have for those that Celebrate the Offshore Lifestyle. 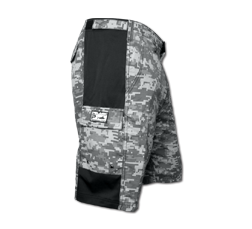 Pelagic Gear: "International Shorts - Grey Camo"
High-Performance Technical Fishing Shorts. Tested to battle the toughest of the offshore elements, the International Shorts are built with heavy-duty Quick-Dry Nylon, yet provide an unmatched level of maneuverability with 4-way stretch side-paneling. Complete with adjustable waistband straps, front zipper fly, cargo pockets (with draining grommets), rear pockets, and angler-minded utility pockets, these shorts will soon become your go-to pair – on land or at sea. Pelagic Gear: "OCP Sailfish Boardshort"
It’s inspiration, captured in offshore fashion. New from PELAGIC come the OCP Sailfish Boardshort, complete with the beauty and majesty of the ocean’s most prolific billfish. The stealth and speed of the Sail resonates as the fish is miraged on a backdrop of black and blue – watch the pack as they school up a ball of bait and slash their way through! Custom imagery by renowned underwater photographer, Tony Ludovico, matched with the comfort of PELAGIC’s ultra-comfortable proprietary 4-Tek 4-way stretch fabric, makes the OCP Sailfish Boardshort a must-have for all fishermen ranging from the encouraged beginner to the savviest of big game anglers. 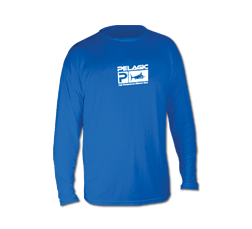 Pelagic Gear Performance Tops: "Vaportek Series"
For those that are constantly combating the heat while in search of that next big bite, the Pelagic VaporTek Shirt is simply a must-have. 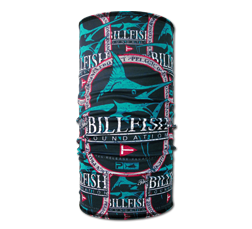 This addition to our line of performance fishing gear is built with a specially treated 100% polyester fabric with 50+ UPF rating. The unique “STRETCH FLEX” fabric is water repellent and stain resistant with anti-odor properties that will battle the ocean’s elements alongside you. 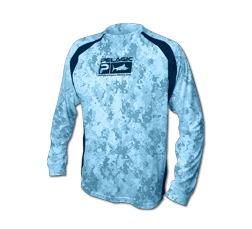 Featuring full-length vented mesh panels and our famous Dorado skin pattern, the Pelagic VaporTek shirt is breaking new ground when it comes to performance fishing apparel. 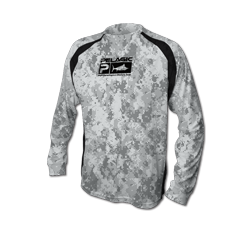 Pelagic Gear Performance Tops: "Vaportek Camo Series"
Pelagic Gear Performance Tops: "Aquatek Series"
Do you have the top in XXL n Bottom size 40. With regards to the many enquiries about the availability of larger sizes, you can place an order with our dealers for them. Do contact Lure Haven for more details. Thanks! With regards to the many enquiries on where the apparel is sold. They are available at Lure Haven. Thanks! Hi boss...do u hav new range of pelagic snapback caps in stock or can i place an order?